Katie Ford, 26, was just nine when she was diagnosed with the disorder - but she never let it get her down. Katie Ford is attempting to explain what it feels like to have an epileptic seizure. Diagnosed at the age of nine, the 26-year-old had been plagued by the frequent, almost imperceptible petit mal fits since she turned four. During the years following her diagnosis she suffered up to two or three of the small seizure a day, and around three fully-blown convulsions – or grand mal seizures – a week. “They were like a panic attack but almost more potent,” said Katie. “I would be looking disorientated, you probably wouldn’t realise I was having a seizure with the smaller ones. “The grand mal seizures completely take over your body - it’s a non-specific and terrifying feeling. Growing up in Edinburgh, the former St Margaret’s pupil went on to spend the next four-and-a-half years of her life in and out of the Royal Hospital for Sick Children, where doctors tried to pinpoint what was causing the disorder. After undergoing a series of investigatory procedures, drugs trials and operations, Katie was eventually put forward for major surgery to remove her right temporal lobe. “I underwent lots of tests to make sure the operation wouldn’t have any dramatic long term effects on things like memory, speech or other major senses. Eventually, in 2001, I had the neurosurgery in 2001. Katie now wants to thank the Royal Hospital for Sick Children for their part played in her recovery – and the Sick Kids Friends Foundation for funding the video telemetry equipment used to confirm she was a candidate for the right temporal lobectomy. “One of the best questions I was asked was, ‘were you not scared?’ My honest answer was that I wasn’t – my mum told me my surgeon, James Steers, was the best neurosurgeon in the country. But, growing up to follow a career in the police, Katie experienced a life-changing setback when, after completing her training, she suffered a seizure. Her resulting medical dismissal from Strathclyde Police and loss of driving license was just the start of a new chapter, though, and, as far as Katie was concerned, opened the door to the challenge of a lifetime. “It was a setback but actually thinking about it, everything happens for a reason. Had I not come out of the police I wouldn’t have my bike. After losing my driving license because of the epilepsy I made the decision not to drive any more and took to cycling. Immersing herself in the sport Katie, who is now a community fundraising officer and campaigner for Epilepsy Action, made the ultimate demonstration of her fitness when, in 2008, undertook the gruelling 3000-mile Race Across America cycle challenge as part of a four-woman team. Now two years seizure-free, she plans to test her endurance skills even further by becoming the first ever British female to become an official finisher of the bicycle race, dubbed ‘the world’s toughest’. “The first time was difficult but a fantastic learning experience for what I will be doing in the future. For me, taking on the race was fantastic on a whole number of levels; it was a great place for me to go to clear my head, it was a great place for me to meditate and just get on my bike and cycle. 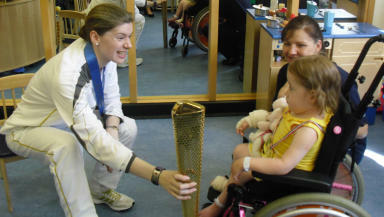 As part of her drive to raise awareness of the condition, Katie, who is on the board of the Olympic veladrome trust and is the youngest trustee on the board for Interactive, sport advisers for disabled people in London, fulfilled an ambition to carry the Olympic torch in July. On Thursday she brought it in to the Royal Hospital for Sick Children to pay a special visit to the people who cared for her and the youngsters receiving treatment. “Ward 7 will always be very close to my heart – or head,” she said. “I can’t put into words how big an effect it has had. It was quite weird going back to the hospital - it taught me quite a lot, it moulded me in quite a big way.